Rev up the Mystery Machine� because Shaggy�, Scooby� and the rest of the gang have some mysteries to solve. Put yourself in the shoes of Shaggy, as he and Scooby venture off in search of snacks while Freddy�, Daphne� and Velma� head in another direction. Unfortunately, Shaggy and Scooby find more than snacks - they also find trouble. At Blake's Hotel, find the clues that will trap the so-called ghost of an ancient chieftain that is scaring away all of the guests of Daphne's Uncle. A fun-filled day at the carnival turns into a mission to find a clown bent on revenge and rescue Fred, Daphne and Velma. These interactive mysteries let Shaggy pick-up and examine objects, and eventually use them to set a trap. Scooby will help out by pointing and sniffing around. Put all the clues together and you've solved the mystery! --From the Genesis Scooby Doo Mystery instruction manual. 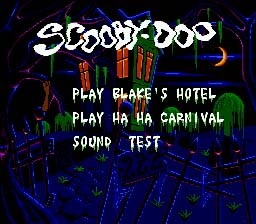 �����Scooby-Doo has two mysteries to solve: one in a Haunted Hotel, the other in a Circus. The stories start like a Scooby-Doo cartoon, informing you of the situation and introducing the suspects. When you begin the game for the first time, keep your finger off the trigger and allow the introduction to play and you will be as prepared to solve the mystery as would be Miss Marple, JB Fletcher, Magnum or Barney Fife. �����In addition to having a storyline, Scooby-Doo actually has a story. The game has better interactive capabilities than the typical �solve everything with mindless violence� games that are in the market place. Numerous actions can be selected to accomplish tasks rather than a simple choice of weapons to kill something with. Your character can not only talk but can even listen too. �����Scooby-Doo is non-violent and requires you to look, think and remember. Shaggy and Scooby-Doo are not limited by lives, energy or time. The objective is not to score points, kill creatures or advance to the next level, but to solve a mystery. If you want a change of pace from the routine, try this game. Listen to the introductions to the games, look at everything and use the Actions. You have unlimited time, lives and energy. �����To select an action from the list at the bottom of the screen: press the B-Button to change from Shaggy to the cursor, move the cursor with the D-Control to the action that you want to use (it will appear in a blue rectangle) and then press the B-Button again and the action will turn white. Then using the D-Control, move the cursor to the object that you want to use the action on and press the B-Button to actually use the action. It is a lot easier to do it than to describe it. �����Use___With___ that allows Shaggy to direct an Action of one object to another object. �����Example: �Give food To Scooby-Doo. �����You collect items that you find using the �Take� action that adds them to your inventory. You view the items in the Inventory by pressing the C-Button. You select them the same way that you select an Action. Passwords allow you to enter the game somewhere other than the beginning.